The virtual machine grub file didn't actually have any password in the grub file, so I tested the function to dump all lines starting with set. Here is a screenshot of the same. Would be good to add the credit to the database as well. Database as in, the name of the file from which the password was gathered? Storing credentials in the database should only be performed if the credentials are parsed appropriately. Parsing the grub config is not as simple as splitting by whitespace. For this reason, the lazy option of simply matching and printing every line beginning with /password/i is far easier. Also, private_type: :password is reserved for instances where the clear text password is stored. 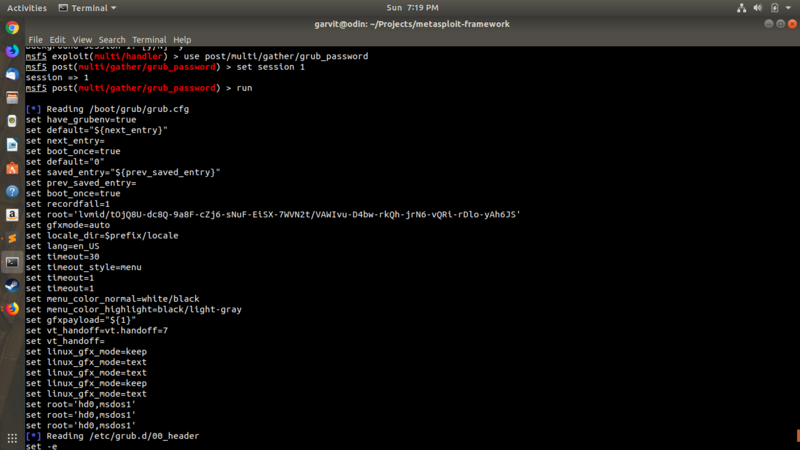 GRUB passwords can be hashed or encrypted, in which case private_type: :nonreplayable_hash is appropriate. You are right, I was faced with the same challenge. I'll research GRUB for various configuration formats! Also, if you go that route, then a better approach exists for your loop. Instead of shoving everything in a loop and using a found variable, then relying upon it at the end, you can instead build up a Hash of credentials ([username] / <private> / <private_type>). Then, once all files have been parsed, you can iterate through the Hash, storing each credential in the database, and building a pretty table for output to console. @bcoles I see that there's a delayed label. What kind of improvements are you looking for, perhaps I could assist? The module should be updated with appropriate parsing for the extracted password.